Cliff Simon was born in Johannesburg, South Africa. He worked in Europe for 12 years as a professional model and dancer, and performed for two years at the Moulin Rouge in Paris as a dancer and lead singer. He returned to South Africa in 1987 where he took up modeling full time, winning the Mr. South Africa title in 1992. Shortly after winning the title he began work on Egoli: Place of Gold, a soap, where he stayed until 1999 when he packed his bags and moved to Los Angeles with his wife Colette. 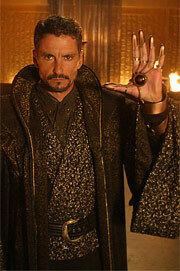 Cliff now has a recurring role in Stargate SG-1 as the Goa'uld Ba'al. Gilles Nuytens: You play on Stargate since the season 5, your character has evolved a lot since his first appearance. It has gone through a really minor part to a quite important one during the season 8. Did you make any changes in the way you approach your character? Cliff Simon: I changed the way he reacts to others. I have tried to make him appear more human, as in giving him some depth with emotions etc. as I think this makes a more complete 3 dimensional character as opposed to being a cartoon bad guy the whole time. Gilles Nuytens: During the season 8, your character has also a humorous side. Is that your idea or the writers will? Or did that came naturally while acting ? Cliff Simon: Ba'al's humorus side started with me and then it seems that the writers have followed it through which to me as an actor is a sign of good writing as they are aware of how the character is working. Gilles Nuytens: What do you think you personally bring to Ba'al and did you get any "benefit" from him? 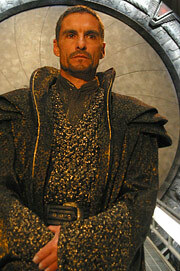 Cliff Simon: I think I bring a whole new dimension of bad guy to Stargate as there has never been one of me. I bring my dark side as Cliff to my character, which is how one as an actor develops a character. Gilles Nuytens: As viewer we feel that there's a kind of complicity between O'Neill and Ba'al, did you have any special kind of preparations for those scenes you played with Richard Dean Anderson? Cliff Simon: No those scenes were just spontaneous and reactive ,and ended up working very well. The art of acting is reacting and so a scene becomes spontaneous and real. 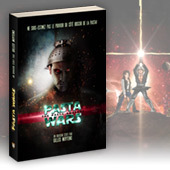 Gilles Nuytens: Do you have any funny anecdote to tell us about the shooting of Stargate ? Cliff Simon: Nothing in particular, just that its always fun to work with such a great cast and crew. Gilles Nuytens: What made you audition for the role of Ba'al? Cliff Simon: After meeting with the exec producer about 8 months before the character of Ba'al was created we decided to wait until the right character was written into the story for me, so Ba'al ended up mine and I was very lucky. Gilles Nuytens: You would like to play on stage, which role would you really like to play? Cliff Simon: No role in particular, but it would have to be a hard hitting strong character with a great story to tell. Gilles Nuytens: You spend a couple of years in Paris and worked at the Moulin Rouge. Could you tell us some words about the years you spend in France? Cliff Simon: My year at the Moulin Rouge in Paris was the best year of my life as I was completely free. In the way of relationships responsibility etc. I only had to look out for me. I had been in a stormy relationship before that for about 6 years so when I eventually broke that tie and moved to France it was great. Working with all those people from all over the world was a great experience, my good friend who was the principal dancer just finished off awhile ago and we are still friends, saw him in Vancouver actually whilst shooting Ex Deus Machina, it is such a traditional dance venue that it was my highlight of my dance career to work there. Gilles Nuytens: Have you already shot the " Ex Deus Machina " episode? If it's the case, could you tell us more about the evolution of your character and how you act it ? Cliff Simon: I finished shooting Ex Deus Machina about 2 weeks ago, I would love to tell you more but I can't and I think it will be more fun for all, all I will say is do not miss it, it is a great, interesting episode plus Beau Bridges and Louis Gossett Jr. are in it too. Gilles Nuytens: Off sets, do you see any other members of the team? Cliff Simon: Well I live in Los Angeles and all the other cast members live in Vancouver so unfortunately we don't get to socialize together except when I am up there filming with them. Gilles Nuytens: You are also a model and you won the first « Mister South Africa » contest, do you carry on your career as a model as well as your dancing one? And how do you run everything at once ? Cliff Simon: Yes I was a full time model, worked all over the world and was at the same time dancing in various big shows. All that came to an end when I decided to study drama and pursue the acting more. I dont do any of that anymore. But if asked to do a musical or dance in a musical movie I would love to. Gilles Nuytens: I have a last question, as you spend 2 years in Paris, do you speak a little french ? Cliff Simon: I did learn to speak a little french when I lived in Paris but I forgot most of it since I haven't had to speak french for so many years now, I would love to speak french it is an awesome beautiful language. Gilles Nuytens: Thanks very much for this interview! Looking forward to see you in Ex Deus Machina! Cliff Simon: You are most welcome. Ok man take care and your website looks great!